Cornea is the outer layer of the eye which helps focus and transmit light through the lens onto the retina. 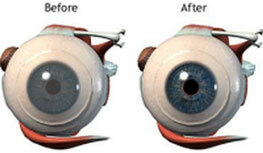 When the cornea is damaged beyond repair transplanting a donated cornea becomes a necessity. 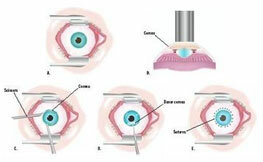 The cornea harvested after the donor's death is screened for infectious diseases before grafting. Partial thickness or Lamella grafts are used to treat conditions of the cornea where the damage is mostly restricted to the front surface of the cornea and only the front part of the cornea is replaced. Full thickness or penetrating grafts are more commonly used and result in the whole of the cornea being replaced. The surgery is performed after the mandatory urine, blood and in some cases ECG ruled out any complications. In the hour long operation the central piece of the cornea is cut and removed. This is replaced by the donor cornea which has been treated with an antibiotic solution. The fine stitches will stay in place for up to 2 years and it will take at least a year to heal completely. The eye is covered with an eye pad and protective plastic eye shield post surgery. This is removed a day after the surgery and normal activities can be resumed as soon as possible. The patient returns home in a few hours.